Hillary Clinton can't decide which of her "Saturday Night Live" alter egos she prefers. The Democratic presidential candidate was ever the politician on Friday as she confirmed to Entertainment Tonight that she'd be on "Saturday Night Live" tonight. 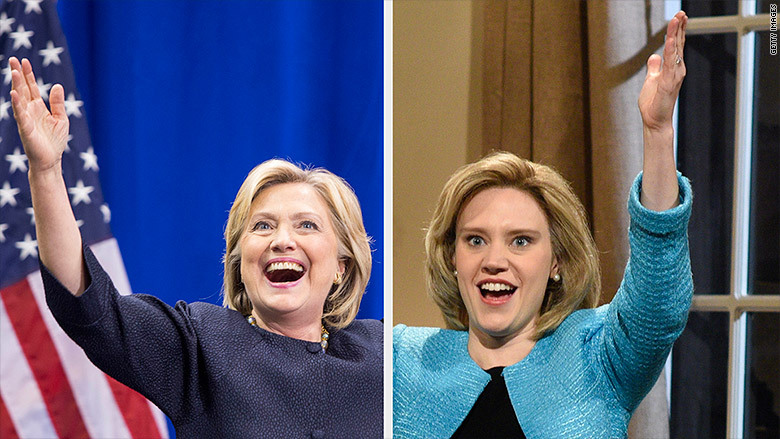 "I love the impersonations of me, first by Amy [Poehler], who's a great friend, now by Kate [McKinnon]," Clinton said. "I like them both and I'm not just being diplomatic. ... They come at it from a slightly different perspective, and I learn something about myself watching them pretend to be me." Clinton said she decided to appear on the show because Lorne Michaels asked her. "I'm just thrilled that [Lorne Michaels has] got these amazing women doing these impersonations, and I want to see how it goes." Saturday's show marks SNL's 41st season. It's unclear what role Clinton will play on the show, which will be hosted by Miley Cyrus. "I've been on SNL before, and it is crazy. You show up, and they're still writing it, and they're putting the airplane together in the air," Clinton said. "I love it because it's almost like a creative act that you're in the middle of and you're participating in, but you're also watching and learning from it."